Writer-director Trent Haaga's 68 Kill has an intriguing premise, mixing ingredients from various sub-genres into a stew that unfortunately leaves a sour aftertaste. Like so many '80s comedies - After Hours, Into the Night, Something Wild - it pairs a hen-pecked male dullard with a wild woman who takes him for a ride, teaching him a few life lessons along the way. In this case however the wild woman is also a femme fatale, the movie's psychotic villain. Scoot McNairy lookalike Matthew Gray Gubler is Chip, a nebbish who shares his home with his ex-stripper girlfriend Liza (AnnaLynne McCord) and seems to have no issues with the fact that she's openly shagging local bigwig Ken McKenzie (David Maldonado) for money. When Liza suggests breaking into McKenzie's home to steal the $68,000 she knows he has stashed away, Chip reluctantly agrees, but is shocked when the ill-conceived heist results in Liza murdering both McKenzie and his wife. With McKenzie's 'housekeeper' Violet (Alisha Boe) in tow, Chip finds himself on the run from his violently deranged girlfriend, who is determined to retrieve both the 68 big ones and the man she claims to love. Despite its wacky grindhouse premise and some gory moments, 68 Kill is never as down and dirty as it believes itself to be. McCord, channeling the spirit of a young Michelle Pfeiffer, is the movie's greatest weapon, turning a crude stereotype into a compelling cartoon antagonist, but she disappears from the narrative relatively early on, leaving us with the blandly written and portrayed Chip and his substitute love interest Violet. As the latter, Boe is a likeable and striking presence, but her character is little more than a two-dimensional male fantasy. Like all those irritating American indie crime dramas that emerged in the wake of Tarantino's '90s success, 68 Kill features a roster of garrulous supporting characters, but the dialogue is never witty enough to sustain interest or justify the rambling, self-satisfied nature of many of its scenes. It's a film that has an over-confidence in its ability to win over the audience, as evidenced by an unearned cringe-worthy singalong to M's Pop Muzik that comes across merely as self-indulgent. 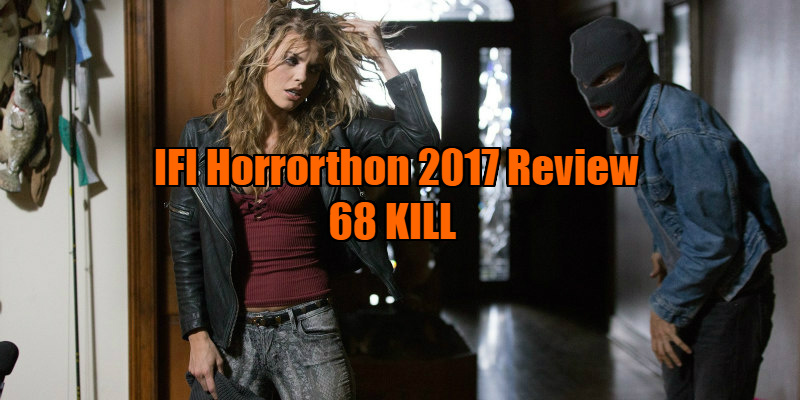 Were it not for its equally bleak depiction of its male characters, accusations of misogyny might be levelled at 68 Kill for its portrayal of women as inhabiting a sliding scale of sociopathy. Haaga's film is a misanthropic look at the American underclass; one whose ultimate message amounts to the sort of advice a drunken frat-boy might give to a love-lorn dorm-mate - Man up bro! A nuanced look at the battle of the sexes this ain't.